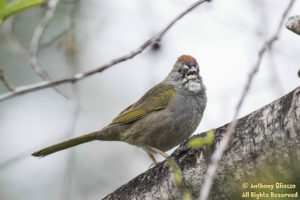 An eBird report was released earlier in the morning by Jeff Bray and Bruce Aird. 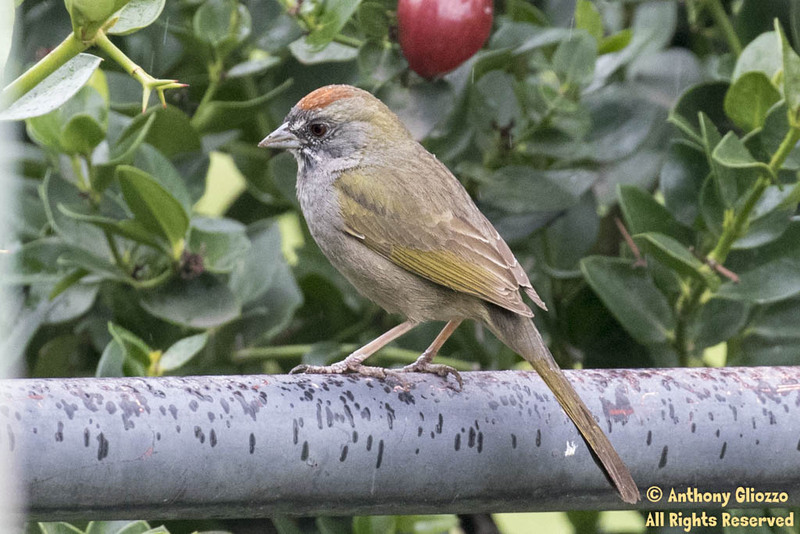 They had located a Green-tailed Towhee (rare for Orange County) in Lake Forest. Mike Sanders and I opted to pay a visit while dodging the rain as it continued on and off throughout the afternoon at around 1:45pm. 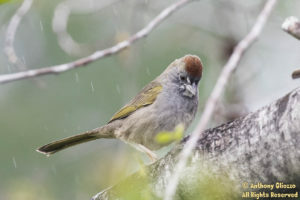 We ultimately found the Green-tailed Towhee at approximately 2:15pm at the same location found earlier in the day just as you drive into the park at the Spectrum Pointe Drive entrance. If you opt to head over to this location, your best bet is just look near the white colored small shed at this entrance. 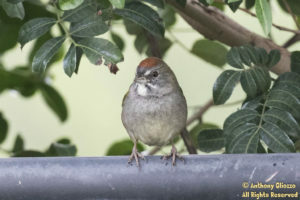 If unfamiliar with Towhees, look on the ground on either side of the wall. This is not to say the species won’t fly upward into a tree. We also noted the Green-tailed Towhee foraging afterward as you drive into the park on the north end. 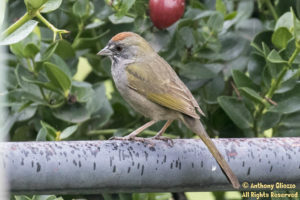 It was foraging below the tubular shaped fence line. 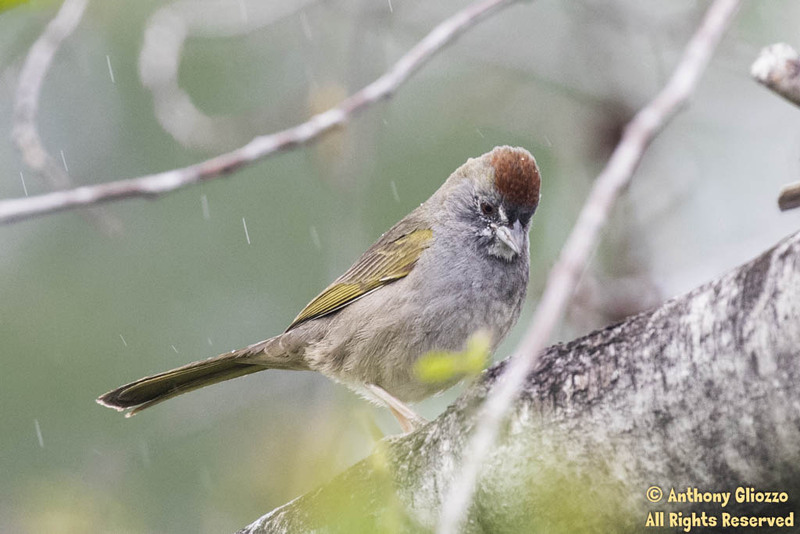 Look for its reddish colored crown, white beard and bright yellow green tinging on its wings. Lois – be sure and drop me an email next time you see this species. Most uncommon for orange county. We get maybe 1-2 a year – thank you. Hi thanks for stopping by and offering the kind words..much appreciated ! Fantastic! I went looking for it last Tuesday. No luck. I saw an eBird report that came out today. it was spotted on 2/27. listen for the “mew call” at the north end of the park where the vehicle entrance is. There’s a small white shed there. If you download the free Merlin app from itunes store or Play Store or acquire the better Audubon Pro or IBird Pro or Sibley’s app you may be able to play the call right from your phone. It does respond to this “mew” call however the song by the green-tailed towhee doesn’t work well. Good luck.